MIAMI – April 9, 2019 – Great Place to Work and FORTUNE have honored Baptist Health South Florida as one of the 2019 Best Workplaces in Health Care and Biopharma. Baptist Health took the #8 spot on the list. The ranking considered feedback representing almost 730,000 employees working at Great Place to Work-Certified organizations in the health care and biopharma industry. Great Place to Work, a global people analytics and consulting firm, evaluated more than 60 elements of team members’ experience on the job. These included the extent to which employees trust leaders, the respect with which people are treated, the fairness of workplace decisions, and how much camaraderie there is among the team. Rankings are based on employees’ feedback and reward companies who best include all employees, no matter who they are or what they do for the organization. The Best Workplaces in Health Care and Biopharma stand out for exceling in a competitive industry. 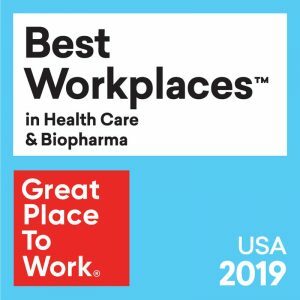 The Best Workplaces in Health Care and Biopharma is one of a series of rankings by Great Place to Work and FORTUNE based on employee feedback from Great Place to Work-Certified™ organizations. Baptist Health also was ranked as one of the 100 Best Companies to Work For by Great Place to Work and FORTUNE.